Marshmallow cheesecake on top of a graham cracker crust with Hershey’s chocolate on top! These S’mores Cheesecake Bars are a cool and creamy way to get your s’mores fix without a campfire. If you guys only knew how much cheesecake has been happening around here. It’s like I was off the cheesecake train for the better part of a year and then all of a sudden I had to make alllllllllll the cheesecake. So the good news is that there are lots of awesome cheesecake recipes coming up! And the better news is that these S’mores Cheesecake Bars are at the top of my favorites list. S’mores Cheesecake Bars have MARSHMALLOW cheesecake. I thought about getting all s’mores-ey with some torched marshmallows on top, but I was having a really hard time translating that into a technique you could duplicate at home without A) expensive equipment, or B) lighting your kitchen on fire, so I decided to skip all that mess and just marshmallow up the cheesecake. And we are doing it right with Fluff. I love excuses to get out my big jar of Marshmallow Fluff! So let’s talk cheesecake for a sec. I think it scares people sometimes. Bakeries and restaurants sell it for like a billion dollars a gold-plated slice, and recipes have all these scary crack-proof techniques that tell you to put your cake in a water bath, or use room temperature ingredients, or hold your breath and hop on one foot. But. Cheesecake is anything but high maintenance. These bars are fool proof. 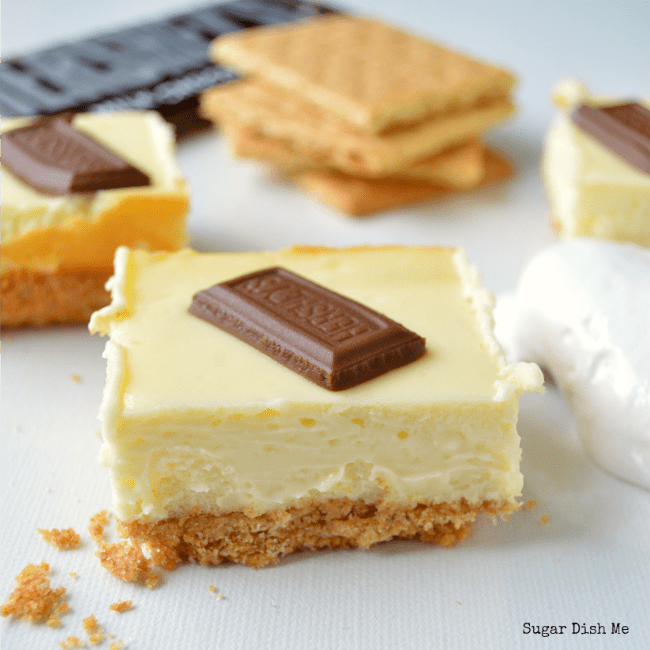 They will turn out without cracking – just smooth, creamy cheesecake – every. single. time. My trick is the oven temperature. You start at 350°. Then you drop it to 275°. Then you just shut it off. The end. Not complicated. It lets everything cook slowly and then cool slowly. No splits or cracks to cover. 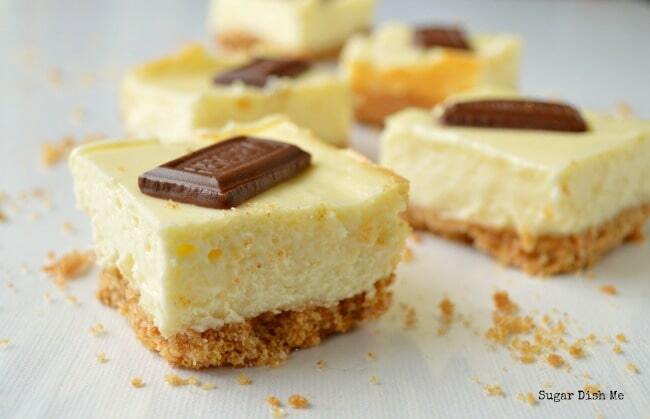 Just perfect and easy little bars of cheesecake. Did you know it’s S’mores Week? Well now you do. Some of my very talented friends dubbed this the week of all graham crackers topped with marshmallows and chocolate, and then they just told us to go creative crazy with it. There are sooooooooo many awesome ideas and recipes. You have found s’mores heaven. Marshmallow cheesecake on a graham cracker crust topped with Hershey's chocolate. Creamy and cool - a perfect way to enjoy the summer flavors of s'mores! Active time is only about 15 minutes, and bake time is 30, but you will need to allow yourself time to let these bars come to room temperature in the oven, plus time to chill before slicing and serving. Preheat the oven to 350°F. Line a 9 X 9 baking dish with parchment or foil. In a medium bowl combine the graham cracker crumbs, ¼ cup granulated sugar, and the melted butter. Press the mixture into the bottom of the prepared pan. In a large bowl beat together the cream cheese, ½ cup granulated sugar, and Fluff on medium speed until fluffy (ha!! ), scraping down the sides as needed. Add the eggs one at a time, beating well on high until combined. Beat for another minute and then pour the batter over the graham cracker crust. Bake for 15 mins at 350°F. Reduce the heat to 275°F and bake for another 15 mins. Turn off the oven and let the cheesecake come to room temperature inside the oven (this prevents cracking). After the cheesecake has cooled for about 30 minutes in the oven, add a Hershey's chocolate square (rectangle!) to the center of each would-be bar; 16 in all. The bottom will melt slightly on the still warm cake and that will help it stick. 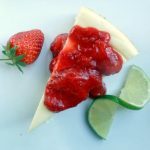 When the cheesecake is at room temperature, place it in the fridge and let it chill for at least an hour before slicing and serving. Cut into 16 equal squares. 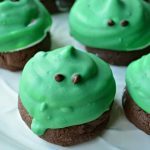 These look unbelievably amazing, Heather! Cannot wait to try them! I am also in love with all of the s’mores goodies that are linked up – off to purchase s’mores ingredients. 🙂 Happy Wednesday! Thanks so much Chelsea! I so hope you’ll try these! They are soooo good! I totally need to get on the smores bandwagon! Looks delish. Especially with the addition of cream cheese. Have a wonderful day Heather! Thank you! And yes! Get on the s’mores bandwagon! Fluff cheesecake?!?! You just made all my childhood dreams come true. Hatch Chile Hummus? You made all my grown up dreams come true! I have a hard time believing you are intimidated by cheesecake. This oven method totally works though! If you are baking a larger cake just increase the 15 min time frames to suit. Thanks Heather! I have never ever had this method fail me. It’s so easy! Oh awesome I bet! I’ve never made my own Fluff! 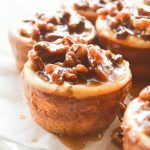 Oh my goodness, these look absolutely delicious! I need to make these happen in my life…and soon! 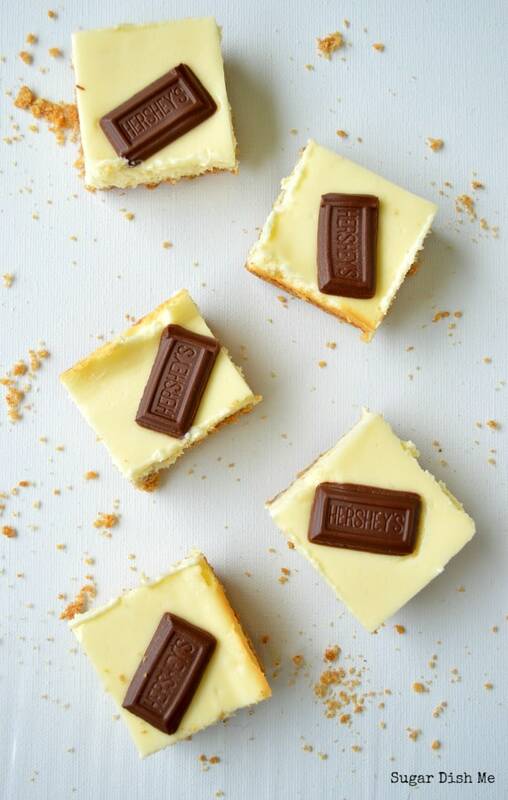 Oh my goodness – I am straight up DYING over these cheesecake bars! They look so delicious. Pinned! Ha – thanks so much Rachel!! 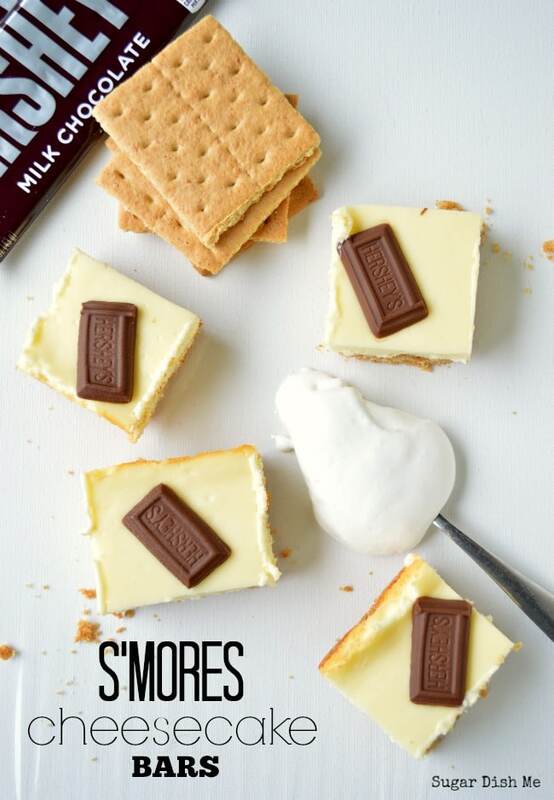 I love the idea of cheesecake and marshmallowy s’more goodness! 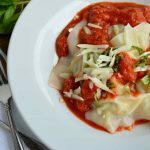 Love this recipe, Heather! Great idea and flavor combo. Heather, Thank you for this recipe! These cheesecake bars are sooo good! My daughter and I love them! They won’t last long; that’s for sure! I am so glad you love them, Jeanne!